Everything you may need! Luxury villa with a tennis court, sauna, large, private pool, and in the vicinity of the beautiful lavender-city of Sault. The villa lies only 5 minutes away from this picturesque village with a view across the valley and the famous and notorious mountain of Mont-Ventoux in the distance. Sault is, similar to Bedoin, one of the three 'official' starting points for the climb of the nearby Mont Ventoux by bike. Around Sault, it's not only wonderful to cycle, but you can also take endless walks through the enormous lavender fields. It's not for nothing that UNESCO has declared this stunning area to be a protected zone! In the area there are many nice villages, and of course the tastiest wine domains for a good glass of Côte de Rhône. The village lies on a rock offshoot of the plateau de Vaucluse and lies at the edge of the department of Drôme. Visit the thermae for a day in the lovely Montbrun-les-Bain, or go to the nature reserve of the Lubéron with the golden triangle of the most beautiful villages of France, such as Bonnieux, Ménerbes, and Gordes. 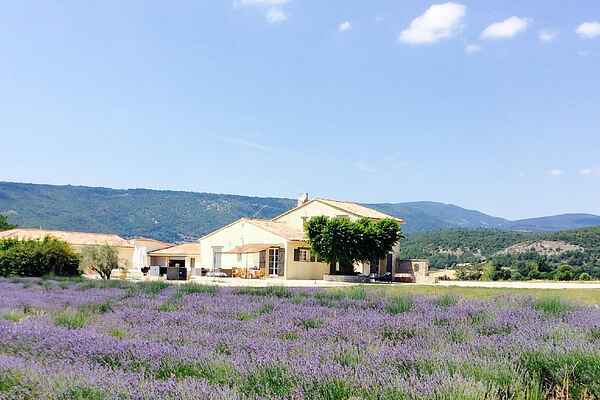 The villa lies in the middle of the lavender fields on a terrain of 5000 m2, where you'll have plenty of privacy. This level villa has a very stylish, rural design, for which materials of high quality have been used. Around the villa you can find some lovely terraces with nice garden furniture, a petanque court, and for the amateur cooks there is a well-kept outdoor kitchen. Here you will certainly have all the ingredients you need for a wonderful vacation!